If meteorologists haven’t promised you snow to bury your whole neighborhood under it, don’t worry. You can still have some fun while joining the famous Doc McStuffins and her friends! Doc McStuffins’s Kingdom is already covered in white! An icy, yet friendly wind blew some heavy, dark clouds towards Doc’s toy clinic and the result is a whole world covered in snow. Surprisingly, Doc’s pieces of advice about keeping your body healthy have finally worked. Do you know what that means? That means no more lines at Dottie’s office, no more ill toys and stuffed animals, no more check-ups to do in order to keep everyone healthy and no more tiresome days at the clinic. Everyone’s healthy, and everyone just wants to enjoy the snow. Are you with us? 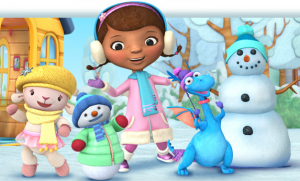 If yes, then let us have some fun with some Doc McStuffins Winter Games! And who do you think is the happiest stuffed animal around Dottie’s house? Chilly, of course! This funny and friendly snowman who happens to question his very own personality is finally free to enjoy his time, without any worries about melting! As he steps outside, Chilly puts his scarf on and is ready to enjoy the snow. Before going on any snow adventure, don’t forget to also put some warm clothes on so you can keep your body’s temperature constant. You can see Dottie’s friends – Stuffy, Hallie and Lambie, doing the same thing. Once you are warm enough to go on a snow adventure, follow us! But how to enjoy the winter spirit if the snow hasn’t come to you yet, some of you may ask. Well, the good part is you still have alternatives! 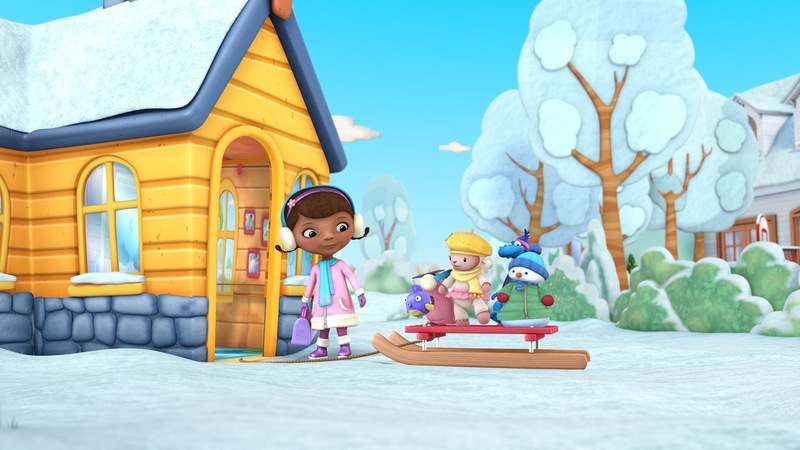 You can try to have fun by playing some entertaining Doc McStuffins winter games that will bring the winter magic closer to you. One of them is Doc’s Snowman Roll-Up game, where you can build a frosty friend for Chilly along with Dottie and her best friends. If you don’t have a chance in real life to roll a snowman, that grows bigger and bigger as you go down the hill, you should really take advantage of the opportunity provided by this game and do that. While rolling down the snowball, just like in real life, you ought to keep your characters warm. To do that, try and collect all the clothes you find on your way. After a few trips down the hill, your virtual snowman will be ready, and you will have a chance to dress him! If you are looking for more action, then you can play Dashing Through the Snow game! Choose a team from among a few Disney crews, and start your race. You will be dashing through the snow on your own, or with a friend. 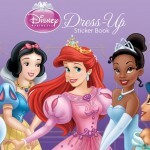 Get your closest of friends, prepare some hot tea with cookies and enjoy a crazy right of Doc McStuffins winter games. If you, however, prefer a cozy atmosphere of your house and you only need the taste of winter outside your windows, try Frost Magic, a game that will give you the chance to draw some paintings on a bunch of frozen windows. Take the cold winter and bring it to your own room. Maybe, you will make it warmer. 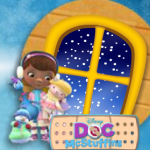 Doc McStuffins winter games are a great opportunity to bring Dottie’s world closer to you. You will both learn and have fun. Follow us, and we promise to bring you some of the most entertaining adventures of Doc’s to your fingertips. If you enjoyed this article, maybe you should also check this list of more Fun Snow Games that you can play during Winter Holidays! Taste the winter and have fun!